In Switzerland German is the primary language in the eastern 2/3 of the country and this includes the city of Lucerne. Lucerne has been described as perhaps the prettiest city in Switzerland and we can confirm that it is quite appealing. Like Geneva, Lucerne sits on a beautiful lake that bears its name and the Reuss River runs through the city. Museggmauer is an imposing wall that has been guarding Lucerne since the 14th century. 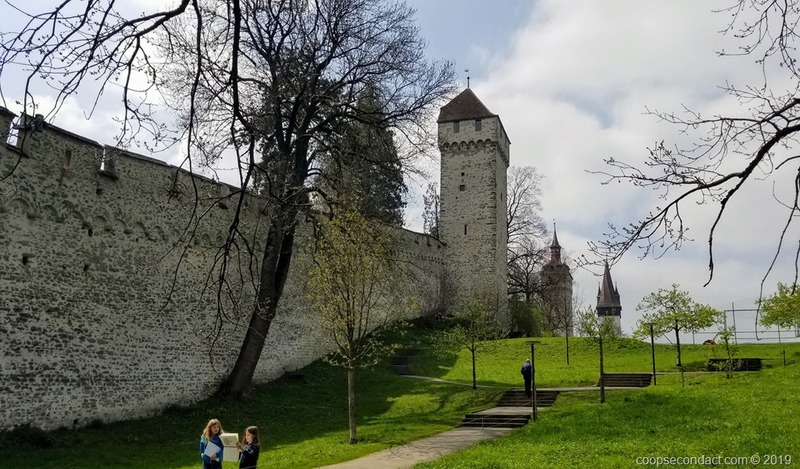 There were originally 30 towers, nine of which are still standing and 4 of which you can visit and climb up to the top giving you terrific views across the city and out to Lake Lucerne. The Zyt tower incorporates a clock that dates from 1535 which makes it the oldest in Lucerne. There is a walkway that allows you to walk along the top of the walls between 3 of the towers. The Lion Monument or “The Lion of Lucerne” is a rock carving that was created in 1820 to commemorate the Swiss Guards that were massacred in 1792 while they were trying to protect the Tuileries Palace in Paris. From the early 17th century, a regiment of the Swiss Guards had served as part of the Royal Household of France. During the French Revolution, as part of the “10th of August Insurrection” in 1792, revolutionaries stormed the Tuileries Palace where more than 600 Swiss Guards were killed during the fighting or massacred after surrender. The Kapellbrücke (Chapel Bridge) is a covered wooden bridge spanning the Reuss River, that was originally constructed in 1635 as part of Lucerne’s fortifications. Part of the bridge complex is a water tower (in the sense of a “tower standing in the water”) that pre-dates the bridge by 30 years. Over the years the tower has been used as a prison, torture chamber and later as a municipal archive. A little further downriver is another wooden bridge, the Spreuerbrücke or Spreuer Bridge, built in 1408. These two bridges feature painted interior triangular frames. None of Europe’s other wooden footbridges have this feature. The paintings, dating back to the 17th century, depict events from Lucerne’s history. Originally there were 158 paintings, but a fire in 1993 destroyed about 2/3 of the paintings in the Kapellbrücke. The Franco-Prussian War (1870/71) ended in defeat for France. The French Eastern Army was under the command of General Bourbaki. 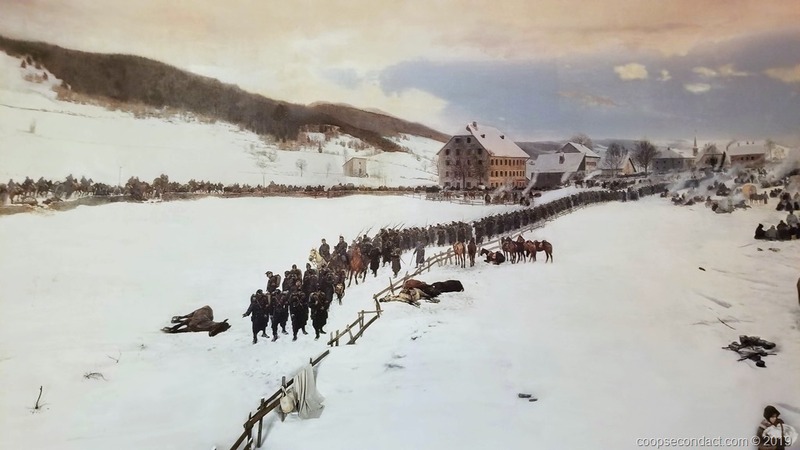 In January 1871 they found themselves surrounded by German troops and were forced to submit to surrender and internment. The terms of the agreement required them to cross the Jura Mountains into Switzerland and give up their weapons. Some 87,000 troops made this journey in February 1871. There were received in Switzerland and dispersed into 188 villages where they were taken into homes, fed and cared for before returning to France 6 months later. In spite of this effort, 1,500 of the soldiers died during this internment. This was the first big test for the recently founded Swiss Red Cross. Edouard Castres was a Red Cross volunteer who made this crossing with the troops and saw the human tragedy firsthand. In 1881, Castres was commissioned to create a painting to commemorate this event. The Bourbaki Panorama is the result, a 360 degree panorama measuring 33 feet high by 367 feet long. It is quite a moving sight. We were not allowed to take photographs but we took pictures of a model of the painting. Like Geneva, Lucerne is a very expensive city for a traveler. But Switzerland does something that helps take a little of the sting out of the costs. Hotels issue their guests a pass for using local transportation, bus, tram, etc. It is generally unlimited within the primary center of the city. Also, in Lucerne, we were issued a visitor card that, in addition to unlimited local public transport, made us eligible for discounts at certain museums and similar activities around the city.